Like ly to say:‘I want to ski black runs well + start off piste skiing’. Like ly to say:‘I’d love to learn how to ski well off piste and/or try ski touring’. Our Advice:Definitely go on an Off Piste Skiing Course to improve your ski technique first, before trying ski touring – you’ll get a lot more out of it that way around! Like ly to say:‘I’d like to ski well in powder/link lots of short radius turns/go ski touring’. Our Advice:An Off Piste Skiing Course is highly recommended. If you’d like to try ski touring, then do either an intro ski touring course or an intro level ski tour. Like ly to say:‘I’d like to handle difficult snow/steep slopes more confidently in better style’. Our Advice:Off piste coaching still useful. Intermediate off piste weeks are at your level too. If you want to get into ski touring, try a touring course or intro level ski tour. 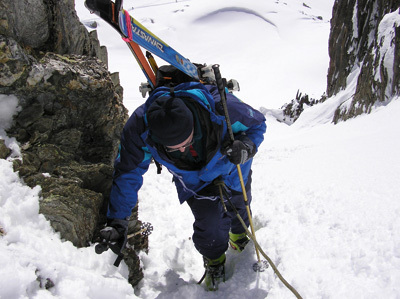 If you’re an established ski mountaineer, then intermediate level tours are generally suitable. Like ly to say:I’ve been skiing ten/twenty years – I’d like to do your ‘……’ tour. Our Advice:You will enjoy our advanced level trips. If you are new to touring – then you could do a Haute Route with a day or two of skills training beforehand (but don’t overlook the physical fitness needed as well). Mileage is the best way to improve your ability level. Like ly to say:‘Bring it on…’. Our Advice:Stay strong – and may the force be with you… Advanced level trips and ski expeditions are the way forward.